Unknown Legends of Rock'n'Roll is a 422-page book (Miller Freeman, $19.95) with in-depth profiles of sixty of the most interesting overlooked cult rock artists of all time, in all cases including first-hand interview material with the artists themselves and/or their close associates. The book also includes a 12-song, 45-minute CD with rare tracks by a dozen of the acts covered in the volume. The text is accompanied by 90 photos and reviews of the most essential recordings by each artist. Transcripts of interviews with the unknown legends. Exclusive to this website! 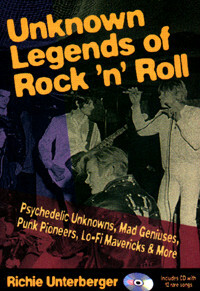 Unknown Legends of Rock'n'Rollis widely available at both independent booksellers and chain bookstores throughout North America, as well as many such outlets overseas. To order on-line via amazon.com, click on the book cover below.